Having finally made it to the Old Town Scottsdale Farmer's Market this past weekend, I was quite pleased with everything that was on offer. Many vendors with pastries and desserts, plenty of produce, eggs and bread and meat, the usual sauces and honey and that sort of thing, and a couple of chocolate companies. Now, there are one or two chocolate shops in the area that I've been meaning to visit, but these two I had never heard of. 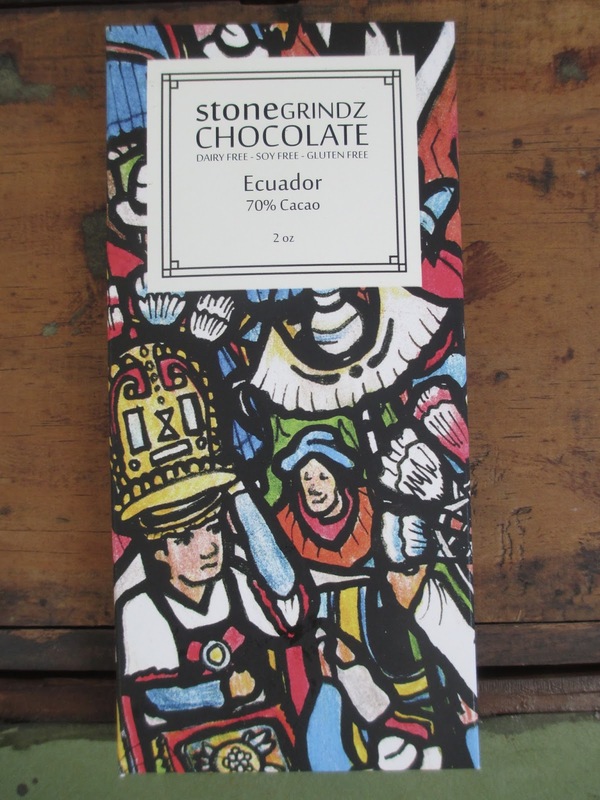 To begin with, I picked out the Ecuador 70% bar from Stone Grindz Chocolate. Stone Grindz has a recognizable look, both clean and artsy. Local artist Joe Mehl provided the artwork. If you take a look at the flyer I got from their table, you can see that the image on the chocolate bar is one section (right around the bottom middle) of a larger piece that shows the land and the farmers from the areas where the cocoa is grown. You can see the cocoa pods there in the center. While the artwork proves that artsy vibe, a clean white square label balances everything out and locks in elegance. The card box folds open like an envelope to reveal a clear-wrapped bar. Here we find simple elegance once again with a plain design, just 18 defined squares. This company knows where to use complex shapes and designs and where to hold back. 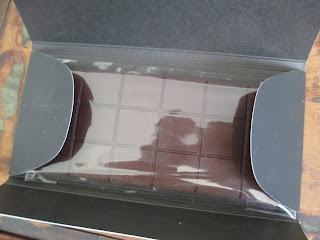 There is a fragrant, fruity smell to the chocolate. The surface looks good. 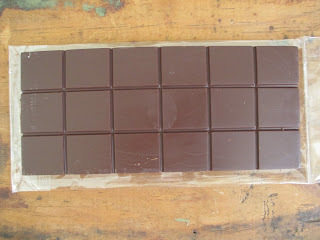 As I mentioned, this is a 70% cocoa content chocolate; the beans are sourced from Ecuador. 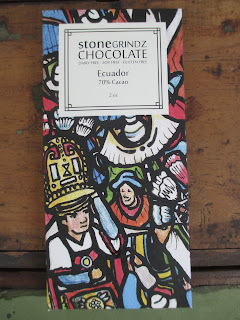 Stone Grindz uses heritage cocoa beans for this bar, and on their website they say that they are fair trade. Given the verbiage about sourcing the cocoa and the traditional practices of the farmers, I did expect that might be the case. The cane sugar and added cocoa butter, by the way, are both officially labeled as organic. Oh, and there are only the three ingredients, so there is no vanilla in here. The flavor of the chocolate begins tender and red, nice and warm. The texture is very smooth, though not overly so. A deeper, rich chocolate flavor comes in, accented by sweetness. Here the flavors are the richness of fudge and flourless chocolate cake. There is note of cream, almost like how it tastes in milk chocolate--except that here it is surrounded by dark chocolate; I don't think I had ever come across a flavor note like that before. You could say that there is a vanilla flavor note at this point, as well. This is one of those situations where I say that there is sweetness in the good sense of the word, a flavor that is always accompanied by chocolate. It doesn't really melt away with any new flavors, just that wonderfully rich and appropriately sweet chocolate flavor. The aftertaste is nice and warm. Plainly put, it tasted wonderful. For anyone looking for good chocolate flavor and not necessarily wanting all the flavor notes of tobacco and apricot and marshmallow and whatnot, this will be a great find. And because the chocolate has that sense of sweetness and zero bitterness while still maintaining that rich chocolate flavor, I would definitely recommend it for the average person. Whether it's someone whose idea of dark chocolate is still Hershey's or someone who's used to craft chocolate, this is a good bar to try and also a great bar for gift-giving. It's simultaneously a safe and quality choice. 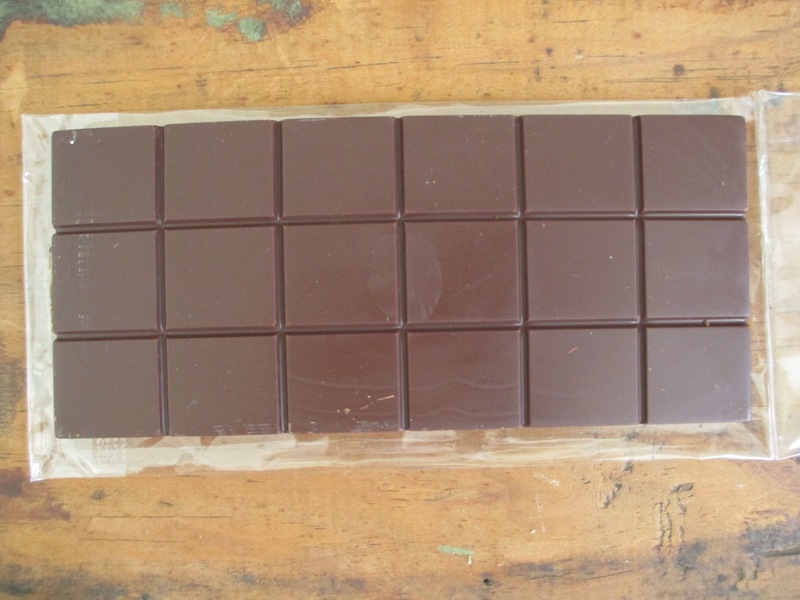 The Ecuador bar also comes in an 84% cocoa content, which sounds quite appealing. Interesting to note, as well, is that it's their Wild Bolivia (which is also a 70% bar) that's award-winning. So I might have to have a look at that one next. Though Stone Grindz makes their chocolate (from the bean) in Scottsdale, they don't have their own shop. You can find them at various farmer's markets around Phoenix, or at a few shops both in Arizona and out of state--you can go to their website to see the full list. I'll finish by saying that I'm thrilled not only to have come across them but to find that they do make quality chocolate that I am genuinely enjoying. Arizona, my dear, you're doing well.